Make a decorative pillow from a luxury bath towel. Take a plush, plain bath towel and add decorative trim, or sew up a luxury, patterned towel with no trim at all – either way, you can make wonderful decorative pillows from bath towels. If you like this pattern, you may also like to try making a Tea Towel Pillow. For my pillow covers, I used a 12 inch by 17 inch pillow form. I used a regular bath towel and the towel size will vary depending on the size of pillow you would like to make. You can use two towels if you like to make a larger pillow by sewing the towels, right sides together to the desired size. For my pillows, I cut two pieces of towel with each piece being one inch larger than my pillow form to allow for the seam allowance. I stitched three seams (right sides together) and then inserted a zipper along the open seam for easy removal of the pillow cover for washing. If you don’t know how to insert a zipper, you can simply stitch together the side seam after inserting your pillow form. To add the trim, you can do this before sewing your side seams together and including the ends of the trim within your seams. However, if you are a beginner, it’s a good idea to add the trim last. Lay your pillow cover flat and pin your trim in place, folding the ends of the trim under and stitch in place by hand. 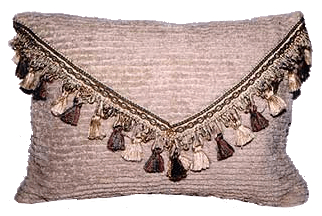 are a very casual fluffy pillow, but with the trim, they become elegant and will fit into almost any decor. These pillow covers are very easy to make, wash up perfectly, are wonderful pillows for the summer months and there are some magnificent ready-made towels available for purchase. Tip: To save a little on the cost, don’t be afraid to buy seconds or damaged towels, as you can usually form your pillow cover around any flaws or irregularities in the fabric.